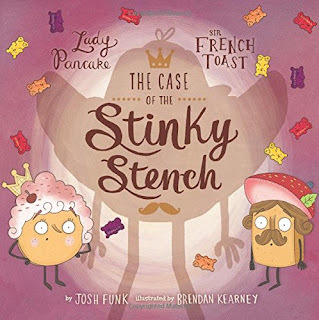 We love a food-based romp, and we couldn't resist the charms of a race around the refrigerator in Josh and Brendan's first book "Lady Pancake and Sir French Toast". Now the two are firm friends, but something's amiss in the fridge this time around and Sir French Toast's nephew, Inspector Croissant needs some help. He's got an uncrackable case - a nasty niff has invaded the fridge and he's the comestible drafted in to solve the problem. But just what is making that dreadful pong? Is it that dastardly rotter Baron Von Waffle? Nope, not guilty m'lud. Is it a stinky old red herring? Nope, that doesn't smell too bad? Just when all hope seems lost, the trio discover that someone forgot to clean out the fridge and a poor lonely individual - in the shape of a neglected fruit cake - pongs to high heaven. Is the jig up for the cake? Is it going to end up chopped up, binned, destroyed? Or perhaps there's another way to help out this poor forlorn cake after all. This story is shot through with sheer inventiveness from start to finish, building on the already adorable characters from the first book with even more fridge-bound friends, and the sort of illustrations and descriptions that will make your tummy rumble once again. Delicious stuff! We wonder if there'll be a third helping? We hope so! Charlotte's best bit: The fantastic fold-out fridge map! 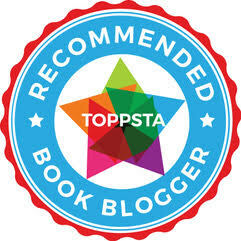 Daddy's favourite bit: Brilliant rhymes, inventive characters and plenty of food that will make your tummy rumble. Hooray for Lady P and Sir FT! "Lady Pancake and Sir French Toast in the Case of the Stinky Stench" is out now, published by Sterling.